It's available... suddenly, without a big fuzz. Lucky that I saw it. I nearly choked when I discovered an advertisement of a supermarket. The specs are okay, but no word on the display if it's resistive or capacitive. 720Mhz sounds just okay, but you won't get blown away. The 1080p output via HDMI sounds impressive. I have no clue what those RAM expansion means. 256MB RAM is not enough. But they write something about 2GB NAND Flash. Is this used for main memorey to install apps, or just a emulation of a SDCard? And the suspicious "Can be extended with USB-HDD"... hum. Another big question will be the display as I mentioned before. 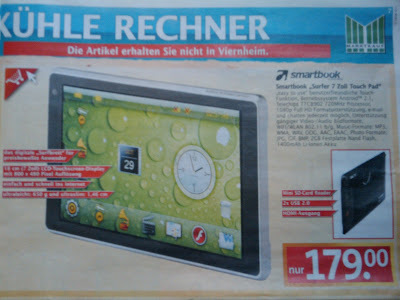 A resistive display like the Archos 7 is using would be very disappointing. I'm trying to get my hands on it and I'll definitely let you know, if I can get more information about it.